Today is the first day of the American Legislative Exchange Council’s (ALEC) annual meeting. State legislators from around the country will be attending, as will representatives from corporations looking to pitch model legislation. There will also be spies. Activists from several progressive groups will sneak into the Salt Lake City conference, (at least, they'll try), in hopes of capturing some of ALEC's model legislation. They will be especially motivated now that mass outrage over Florida’s Stand Your Ground law, an ALEC-modeled statute which many presumed would form the basis of George Zimmerman’s legal defense for shooting Trayvon Martin, has lofted ALEC's profile. 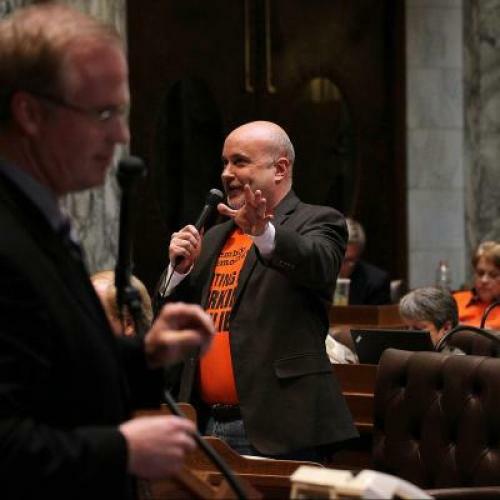 But long before ALEC watching became its own cottage industry, there was Mark Pocan—a Wisconsin state assemblyman who spied on ALEC for more than a decade and frustrated its attempts to advance policy in the Badger State. For 14 years, Mark Pocan has represented an oblong district encompassing much of downtown Madison. Senate candidate Tammy Baldwin, Pocan’s longtime friend, emerged from this same, very liberal state district. (To wit: Pocan is credited with coining the term “FitzWalkerstan,” referring to Gov. Scott Walker; today, he is running for the Democratic nomination to succeed Baldwin in Congress.) He is a longtime Wisconsinite—his nasal, upper Midwest accent was immediately noticeable when we spoke by phone—and so he was left nonplussed when, in 2003, a Republican assemblyman proposed a bill to bring bail bondsmen back to Wisconsin. The bill would have reversed a ban on private bail bondsmen in place since 1979, when the Wisconsin legislature deemed the practice corrupt and predatory on poor individuals. “You’d watch bills like this come in, and you’d scratch your head,” Pocan said. “They didn’t benefit anyone in Wisconsin. Nobody had seemed to ask for them. Where did they come from?” Quickly, he said, he realized that the sponsors of such bills had all been active in ALEC. In the case of the bail bondsmen bill, the sponsor was State Representative Scott Suder, a former ALEC member who had chaired their criminal justice task force; a member of ALEC’s board and a lobbyist for a bondsmen organization stumped for the bill in Wisconsin newspapers. So, after cutting a $100 check, Pocan became ALEC’s unlikeliest member. For years, he used ALEC’s state legislator web portal to download and distribute its model legislation to likeminded Wisconsin liberals. (This feature was removed about a year ago). His fellow ALEC members in the assembly, of course, realized what he was up to, but that didn't much affect his efforts. Over the years, Pocan helped his colleagues mount defenses against a Taxpayer Bill of Rights measure, regressive changes to pension law, a voter ID bill, and a tort reform bill that heavily restricted the legal recourse available to consumers injured by a company’s products, by disseminating their ALEC models before they hit the Wisconsin Assembly. Occasionally, he even passed on ALEC’s environment and energy-related legislation to national environmental groups. His efforts, of course, did not result in the uniform defeat of ALEC’s bills. But an Assembly colleague recalled that by revealing the source of the legislation—unless they were ALEC members, even most Republicans did not realize where the bills had originated—Pocan could often discourage support for ALEC’s special interest measures. His biggest coup came earlier this year, when a bill providing private school vouchers for special needs students appeared on the docket. The bill was strongly opposed by the state’s most prominent special-needs organizations: It didn't require participating schools to have teachers with special-needs expertise or the physical attributes necessary to do their jobs. Pocan had heard the bill discussed at an ALEC policy summit, and he leveraged that knowledge and ALEC’s unpopularity into a stinging denunciation of the bill from the assembly floor. The bill failed for the 2012 session. No longer able to keep tabs on ALEC remotely, Pocan still travels to the occasional ALEC policy summit. In 2008, he went to its conference in Washington, D.C. and wrote a story about it for The Progressive, the liberal Wisconsin-based magazine. Last year, he attended their summit in New Orleans, where popular themes included fracking and natural gas bills, and a member of his Congressional campaign notified me that he would, indeed, be in Salt Lake City for this year’s gathering. The only private event Pocan ever made it to was a cigar party. Sponsored by several corporations, it literally consisted of prim servers proffering cigars to legislators on silver platters. Within five minutes of Pocan’s getting there, an ALEC staffer hurried up to him, asked for his invitation, and, after he produced it, brusquely asked him to leave.